A perfect event for junior and senior high school bands students. Experience Game- Day with the Panther Marching Band! Attend our rehearsal and football game, see our pregame and halftime performances, tour campus, meet our students and staff. Bring your instrument and join the Panther Marching Band in the stands! Perform with the Panther Marching Band on the field at halftime! Ideal for entire marching bands or individual high school students in grades 9-12. 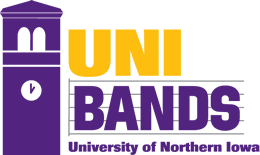 Be part of a massed band that gives an electrifying performance to one of the most appreciative audiences in the country at the UNI Dome! Our annual honor band festival provides the opportunity to perform outstanding literature with nationally recognized conductors. The weekend includes masterclasses with our faculty, performances by UNI student and faculty ensembles, and our scholarship solo competition – a weekend of music making with outstanding musicians.